Joy offers one and two day courses. You can also arrange a longer course for a more complex project. ​On a two day course you could work on a mosaic for inf=doors or outdoors. This could be a more complex project such as a pair of double sided sun catchers, or working directly into cement you could make a number or sign for your front door, or an owl or dragonfly for the garden. 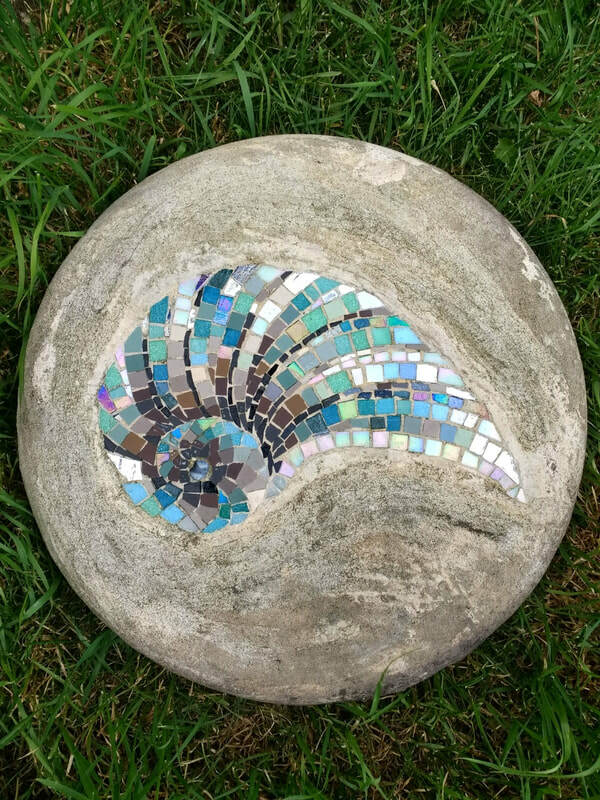 You will be able to make a mixed media mosaic, and on a two day course you could also choose to learn the classical indirect method working in reverse on paper. This technique can be useful if you wish to work later on a larger project. For more information on the indirect method click here. You can work from your own design idea or Joy can help you come up with a design. To create a two day course simply book any two days from the list of dates below. You will need to make a separate booking for each day. To book your place please click on the box underneath 'Select course date from drop down list', select your course date and then click on 'Buy Now'. This will take you to a secure payment screen where you can pay by debit or credit card, you do not need a PayPal account. You can change the quantity if you wish to book for more than one person. To create a two day course you will need to book two separate dates of your choosing. ​If you are uncomfortable about online payments please email me: joysturgessmosaics@yahoo.co.uk or call me 07542797777 to arrange your booking. On all Joy's courses you will complete a mosaic to take home. All materials are included in the course fee. All courses are suitable for beginners or people with some previous experience of mosaic. You can bring your own images and ideas and Joy will help you translate them into a mosaic design. If you have no idea what to make don't worry Joy has plenty of resources. and will support you throughout the process. Joy has a lovely range of materials for you to choose from, and you are also welcome to bring your own broken pottery or other materials to include in your work if you wish. The direct or indirect method of mosaic making onto a durable surface. How to apply basic techniques of andamento into your work. Please contact Joy if you have any questions. 'Joy is very knowledgeable..she is warm, kind and generous. Mosaic Course Gift Vouchers make an excellent and unusual Christmas or birthday gift, and can be used for any of courses. To buy a gift voucher please click here.